Hi everyone! I hope you all are doing well! So the title isn’t a mistake. There is such a thing as healthy Italian food. Ever since I started my new low-calorie/low-carb diet, I’ve missed pasta a lot. I’m also really nervous to eat a lot of pasta because I’m afraid of portion control. While I think I’ve, for the most part, learned how to eat the right amount, and also not eat things like cream sauce and stuff, I’m afraid I’ll still eat too much. It’s a terrible, horrible feeling that I’m hoping one day passes, but still. It is a bit of a struggle and it’s more mental than anything, but I’ll get better about it. I’m sure of it. In light of thinking healthy Italian, REB and I made tofu parmesan on Saturday night. I never was a big fan of chicken parmesan when I ate meat, but I wasn’t a fan of deep fried things. I’m still not big on eggplant parmesan either. However, I found this recipe on Eating Well for tofu parm and decided we should give it a shot! I’m glad we did! It was not only delicious, but it was under 300 calories per serving. Perfection. I wish there was more protein in it, but you can always add some extra sides to make that happen. We did change a few things for our tastes, but it worked great. On a plate, combine the Panko and Italian seasoning. 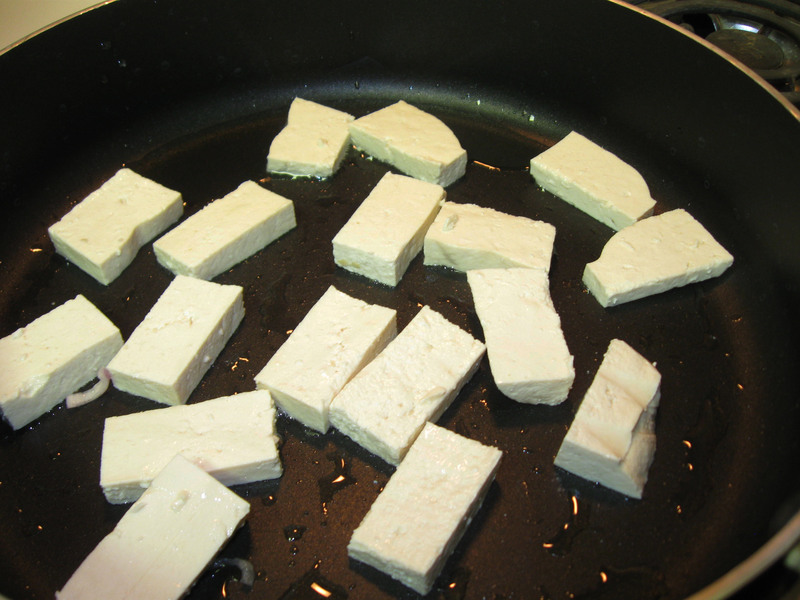 Cut the tofu lengthwise into four “steaks” or pieces. Lightly season each side with garlic powder and salt (we didn’t use the full 1/4 teaspoon for each) and then dredge each side in the breadcrumb/Italian seasoning mix. In a large deep skillet heat the olive oil and then add the onions and let them get translucent and slightly brown, about 5 minutes. Next add the mushrooms and let them sweat their liquid out and turn slightly brown, about 5-10 minutes. Transfer the onions and mushrooms to a bowl. In the same skillet, which you may need to add another teaspoon of olive oil, add the tofu steaks and cook until it’s golden brown (about 3 minutes per side). Turn the tofu, sprinkle with Parmesan cheese, spoon the mushroom/onion mixture on each steak, top with a tablespoon or so of marinara sauce, then the mozzarella cheese. 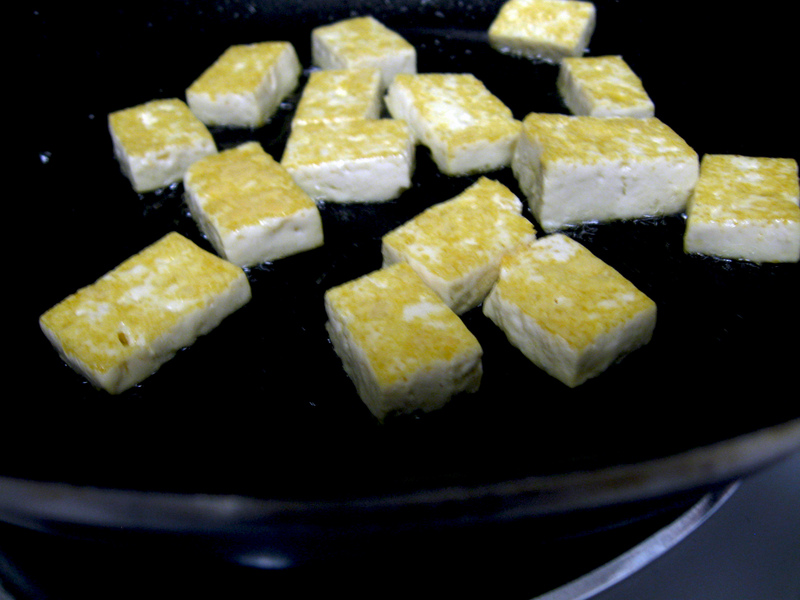 Cover the skillet and let the tofu continue to cook until the cheese is melted, about 2-3 minutes. The last bit is just sprinkling some basil on top of each and serving it up! I’m glad we decided to use Panko instead of breadcrumbs. It made the tofu a little crispier. Note to self: find more recipes to use Panko! Like I said, this recipe is under 300 calories per serving and all delicious! Enjoy! Have you had struggles with weight? What are things you miss eating and have you found alternatives? This entry was posted in Food, Italian, Vegetarian and tagged low calorie, low fat, Panko, tofu, Tofu Parmesan, vegetarian on March 5, 2012 by Aparna B..
Tofu piccata was on the menu tonight! Once again, we went searching in the great Internet space to find another recipe that used tofu and REB found a recipe featured in the Vegetarian Times. It was actually a recipe made with seitan, but we had tofu in our fridge (like we usually do) so we decided to use that. This recipe also called for soy margarine but we used real butter. You could absolutely use that though and make this entire meal vegan! Back in the olden days when I ate meat, chicken piccata was a dish I ordered if it was on a menu at a restaurant. I have an absolutely love of capers. Any recipe that is vegetarian with capers will always get my vote. Why didn’t I think we should try making this with tofu? This recipe is ridiculously easy to make, too! 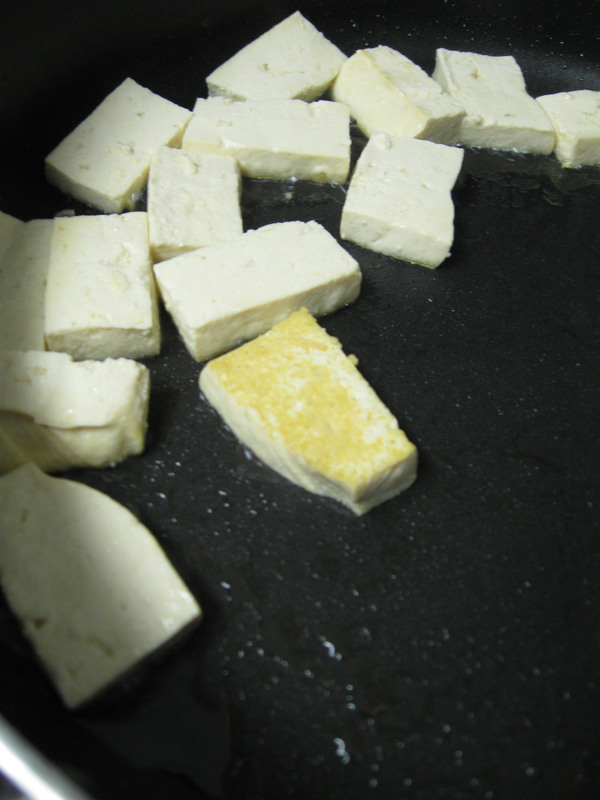 Start by standing up the tofu block and then cutting in half, length-wise. Store the other half for a future recipe. Then cut that half into half. 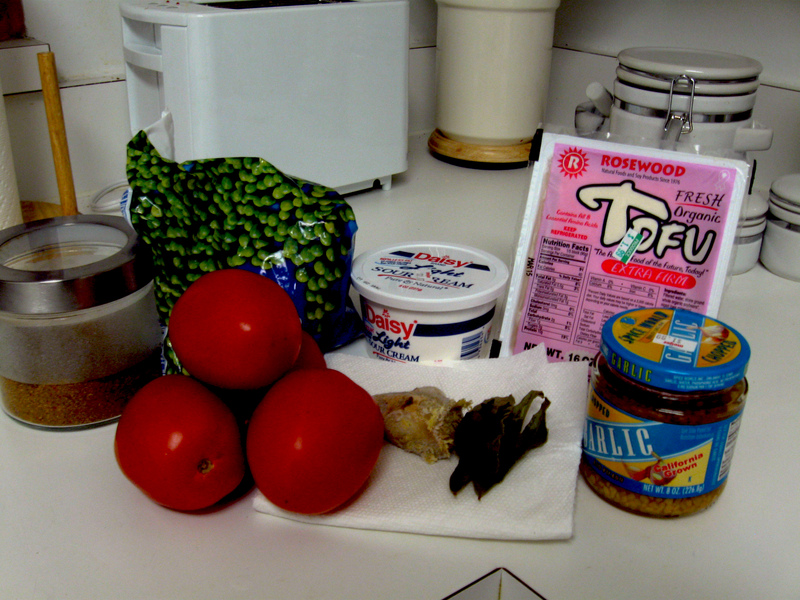 Take two pieces of paper towel, put a piece of tofu between them, and press. 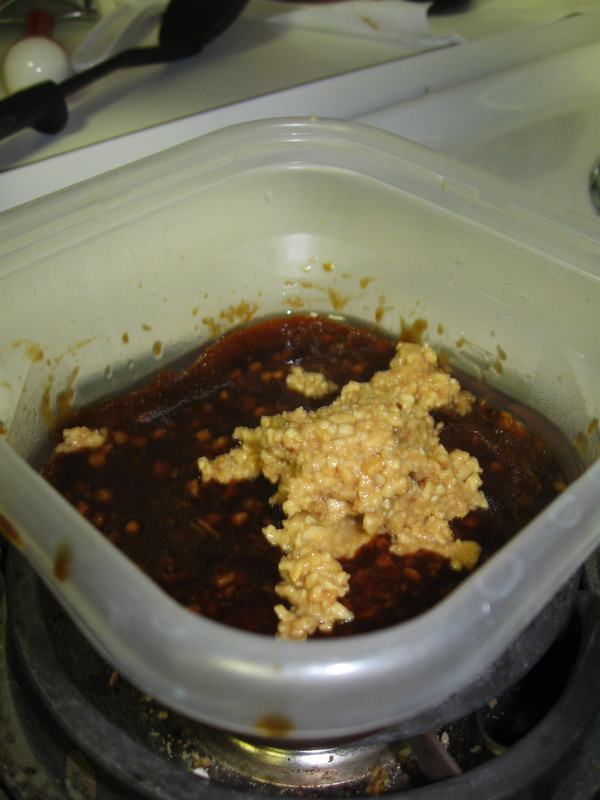 You want to drain as much liquid out of the tofu as possible. Plus, this will help thin the tofu so it will crisp up better. 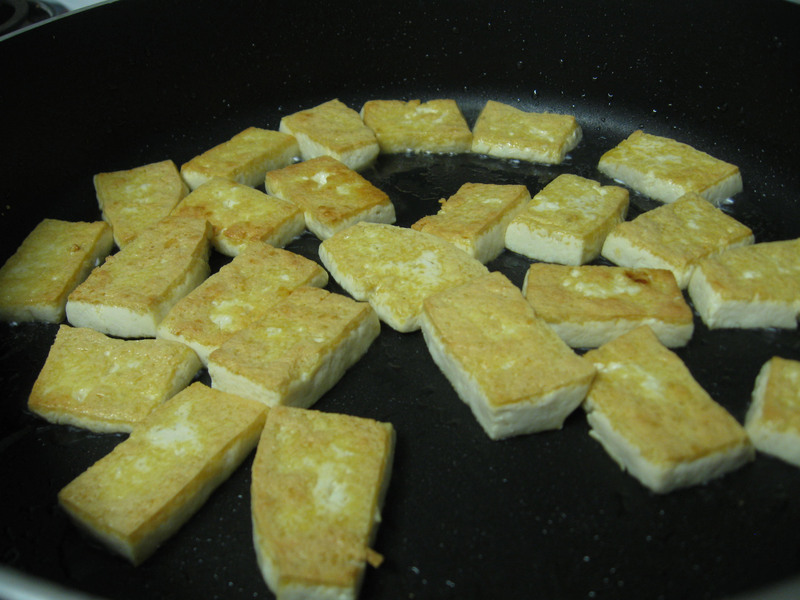 Once you’ve done that, cut each tofu in half, diagonally so you’ll end up with four tofu triangles total. Put a few tablespoons of all-purpose flour on a plate, dredge the tofu and shake off the excess. 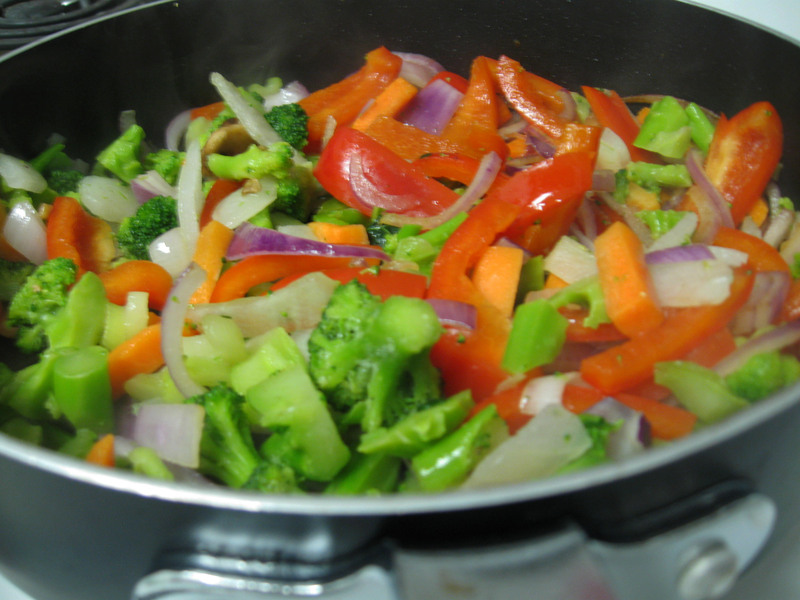 Heat up 2 tablespoons of olive oil in a pan over high heat. Let the tofu cook for 3-4 minutes on each side. Once you’ve done this for all the pieces, transfer to a plate lined with paper towel. We actually put them on some aluminum foil and put them into the oven to keep warm at 300°F. In the same pan, add more oil (about another 1 to 2 tablespoons) and heat up the shallots, garlic and capers and sauté for 1 or 2 minutes stirring frequently. Then whisk in the lemon juice and wine and let it cook for 3 to 5 minutes. 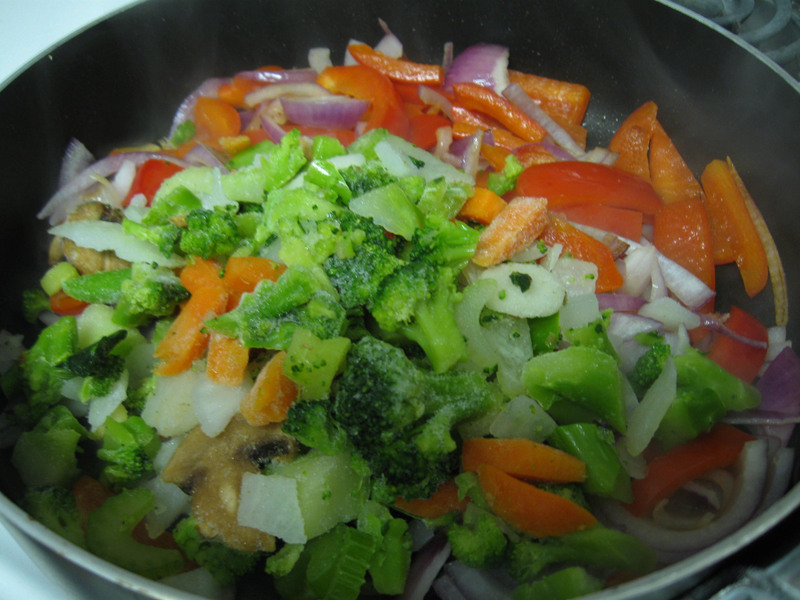 Add the vegetable broth and bring to a boil. Reduce the heat and let it simmer for 1 or 2 minutes. Whisk in the parsley, butter (you could use nonhydrogenated vegan margarine to make this vegan) and pepper. If we had low-sodium broth, I would say you might need to add 1/2 teaspoon or so of salt. However, since the capers and the broth are so salty, taste the sauce first and then use your judgment if you need more salt or not. We served it up with some wild rice, poured the sauce over the tofu and nommed it up! This was so delicious! Patting the tofu completely dry gave it a meatier texture. The capers were crisp and salty, and the wine and lemon together made for a wonderful fresh taste. Now, I will say that I was a little conflicted about the amount of parsley. Ina Garten loves her parsley, but I think it’s kind of a garbage herb. For me, it’s used for garnish and sprinkling on a plate and not a main flavor of a dish. But even I can admit that when it warmed up, it did smell fresh. I probably would use less next time though. This entry was posted in Food, Main Dish, Vegetarian and tagged capers, lemon, tofu, tofu piccata, vegetarian on January 10, 2012 by Aparna B..
We had some leftover tofu in our fridge, so we decided to make something with it that wasn’t Asian-themed. 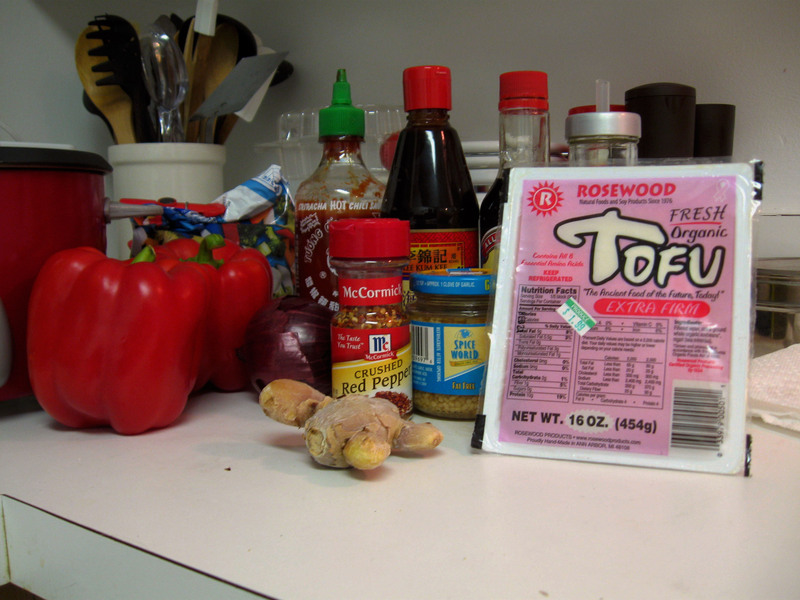 Our usual go to is to make General’s Tofu, but we had that last night, so we wanted to find a recipe that used tofu differently. We found a recipe online for Tofu Marsala and it actually turned out really well! This was the recipe we followed the basic concept from. We didn’t use a whole block of tofu since we were using leftovers, but we made the sauce the same amount. I could have had that sauce entirely on its own, it was so good! Then we prepared our ingredients. We minced up the shallots and put them in a bowl. Then with a damp paper towel, we wiped off the mushrooms, took the stalks off, then sliced them up and put them in a bowl. Then we took the leftover tofu we had (half a block) and just it in half so we had two 1-inch pieces. It was kind of thick, but it was all good. In a separate bowl mix the flour, corn starch and salt and pepper. Rinse the tofu and pat it dry. 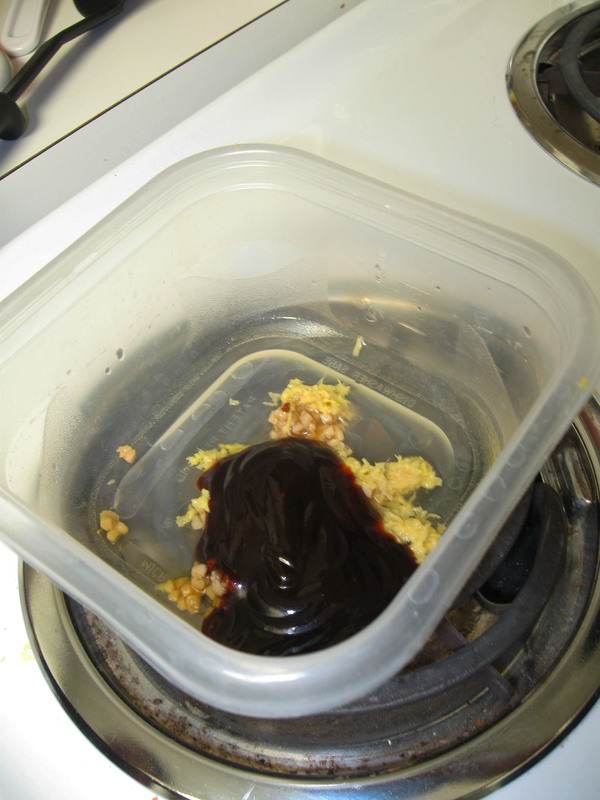 Then dredge it in the dry mixture and shake off the excess. Heat up some oil (about 2-3 tablespoons) in a large skillet over medium high (our stupid stove required it to be high :P) heat. 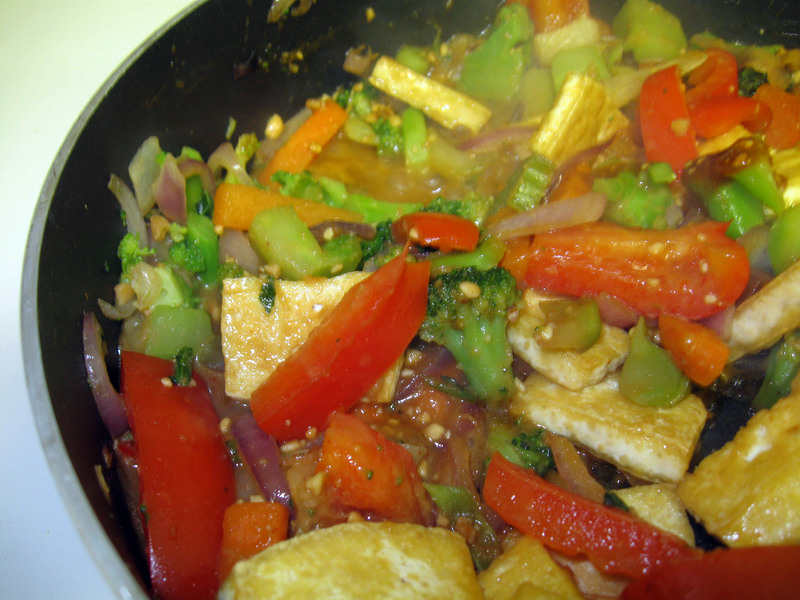 Once it’s hot, put the tofu into the pan and let it cook on all sides until golden brown (about 3-5 minutes. Ours took about 5-7 minutes since we wanted it extra crispy). Transfer it to a baking dish and put it in the oven to keep warm. This was good we did this because I think it helped cook the tofu a bit more since ours was thicker than suggested. In the same skillet, reduce the heat (if you need to) add more oil if needed (another tablespoon) and add the shallots and dried thyme leaves. Stir them constantly until they’re soft (about 2-4 minutes). Add in the mushrooms and stirring frequently, cook them until they’re tender and lightly brown (ours took about 5-8 minutes). Then add in the marsala wine. The smell is unbelievable when it hits the pan. It’s a kind of a sour, pungent smell, but it smells so wonderful with the shallots and mushrooms! Stir and let the pan come to a simmer so the wine can reduce. In a 2-cup measuring cup (one of those Pyrex thingies) measure out the two teaspoons of corn starch, the tomato paste and the vegetable broth and whisk. This creates a sort of slurry or thickening agent. Once you’ve whisked it, add it to the pan, stirring the mushrooms as you do. 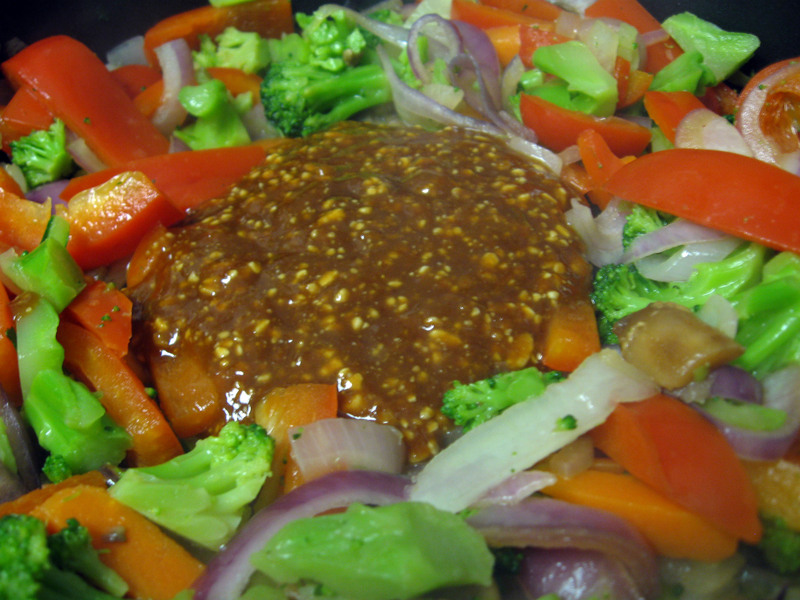 Let this sauce reduce and thicken. We served it up with some store bought vegetable risotto, took the tofu out the oven and spooned the sauce over it. There are definitely things we would change. While this was ridiculously delicious, I think next time we’re going to try it with tempeh or seitan. Both have more flavor from the get-go than tofu does. I mean, the great thing about tofu is that it will taste like what ever your flavor with it, but we wanted some kind of flavor from the beginning. We also think we’re going to mix in some herbs with the dredging mixture. And also use eggs and breadcrumbs for a more substantial crust. I think this recipe is technically vegan, but I think if we could create a better crust, it would be even more yummy. But like I said, it was delicious!! Definitely give it a try and if you find some other way to serve it up, come back and share it! I’m just glad we have another recipe we can make to get some good protein! What are some of your favorite recipes where you substitute the meat with tofu, seitan or tempeh? This entry was posted in Food, Main Dish, Vegetarian and tagged marsala, risotto, tofu, tofu marsala, vegan, vegetarian on December 30, 2011 by Aparna B.. I make a lot of Indian curries. 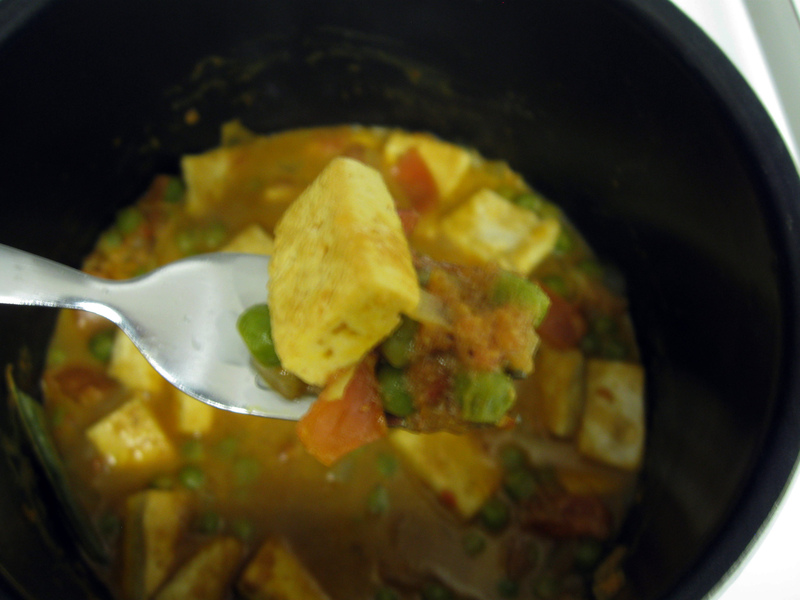 There is one that REB absolutely loves, called mattar paneer. However, I don’t make it that often since it’s pretty much the most unhealthy thing one could eat. Paneer is a type of cheese, similar to feta, but it’s really bad for your health. Not only that, but this dish also has sour cream in it, which in large consumptions, also not that great for the figure. 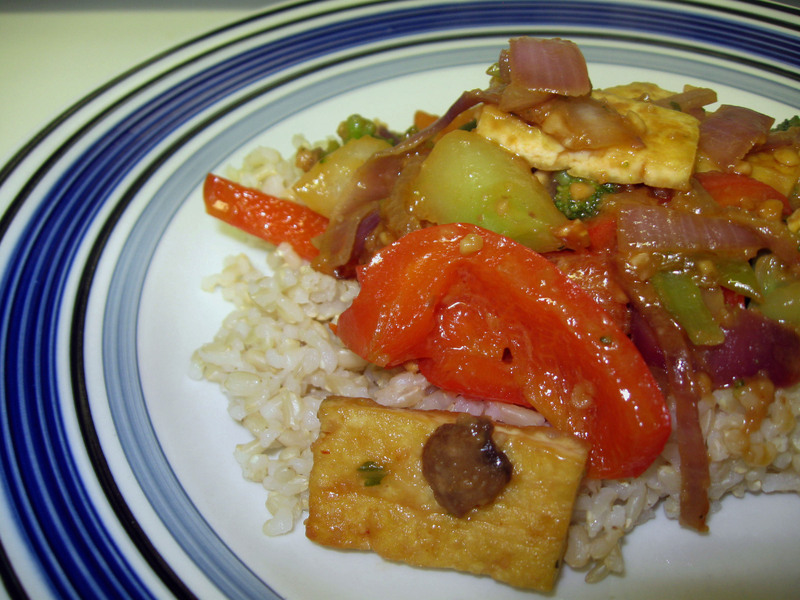 I made a variation of the dish last night and substituted tofu for the paneer. It worked like a charm. I couldn’t cut out the sour cream, but using light, or fat-free works just as well. I’m sure you could even use milk instead of cream. 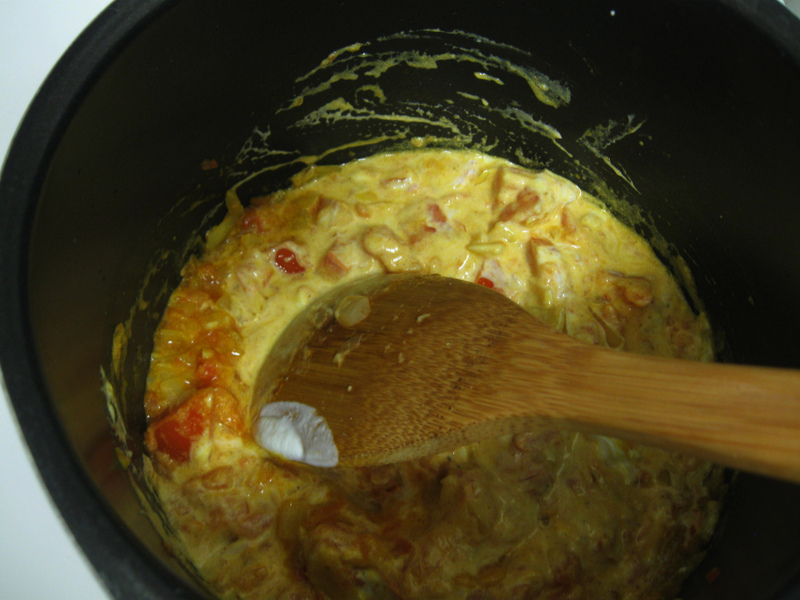 However, the sour cream adds a tang that sort of brings the whole dish together. If you do want to use paneer, you can buy a frozen block from any Indian grocery stores. Some even come already cut up into cubes for your convenience. If you want to make your own paneer, that’s not too hard either, but it takes a lot of time since…well, you’re making cheese from scratch. Ha. Maybe I’ll post something on how to do that another time. Let’s make some curry though! 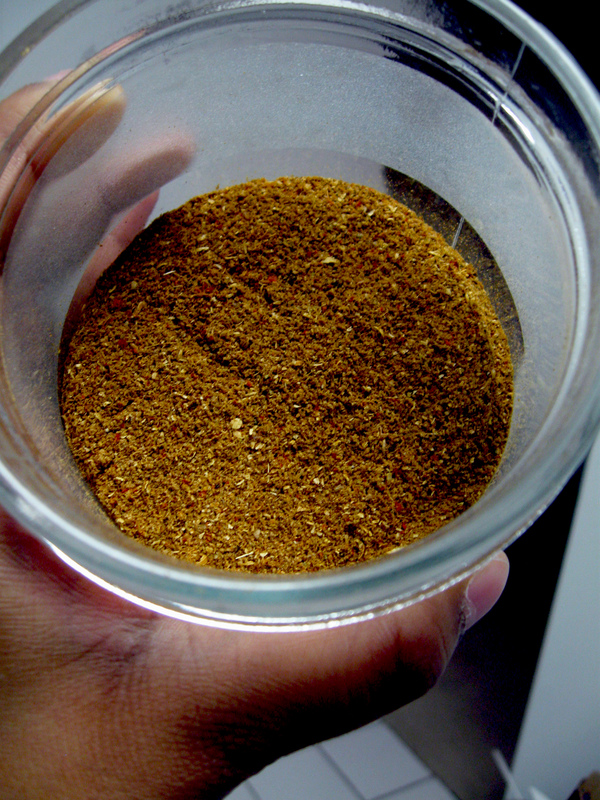 Let’s talk about the garam masala. I’ve mentioned it once before I’m sure, but it’s the most common spice used in almost every Indian dish. It’s essential, it’s fragrant, it’s delicious. 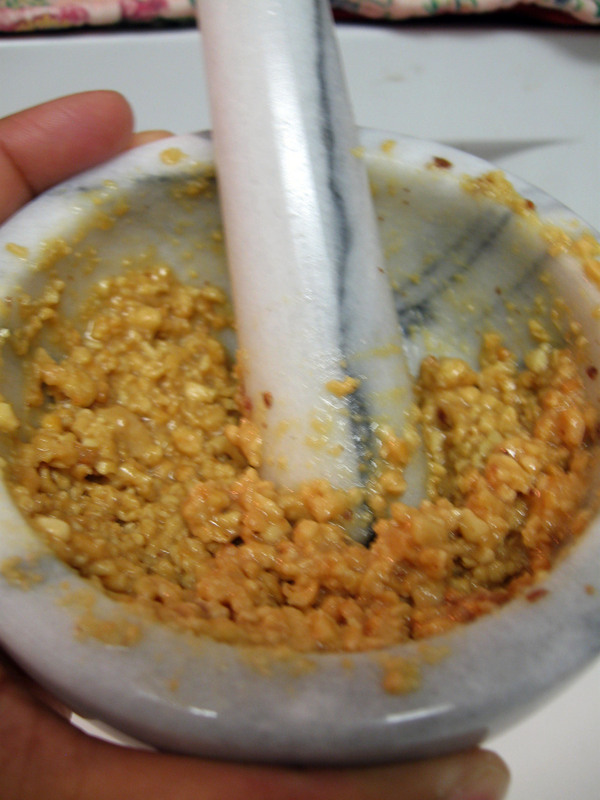 You make it by simply dry roasting several spices and then grinding them to a fine powder. 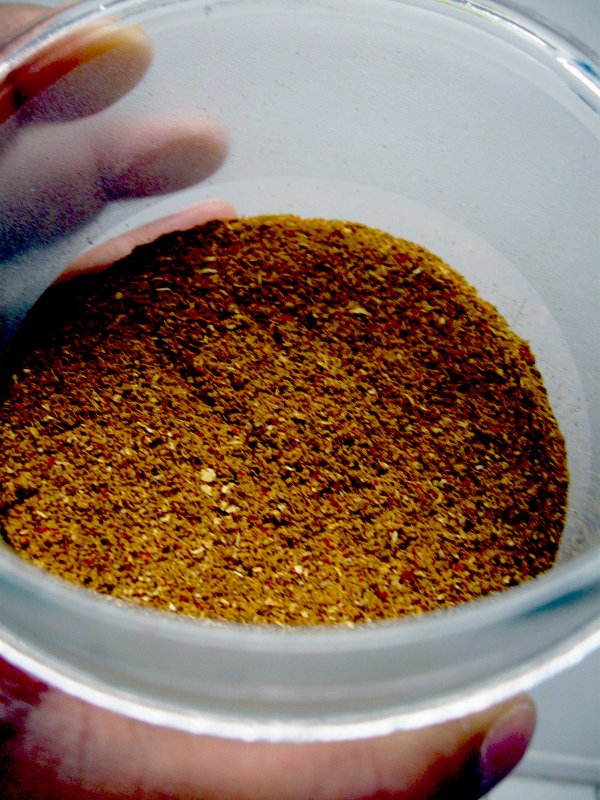 I’ll have to make another post one day about how to make garam masala from scratch. But for now, I have a mom who loves me dearly and made me this entire jarful of garam masala. It’s OK to be jealous. Buying store-bought masala will never compare to the depth of spice and flavor of doing it yourself. 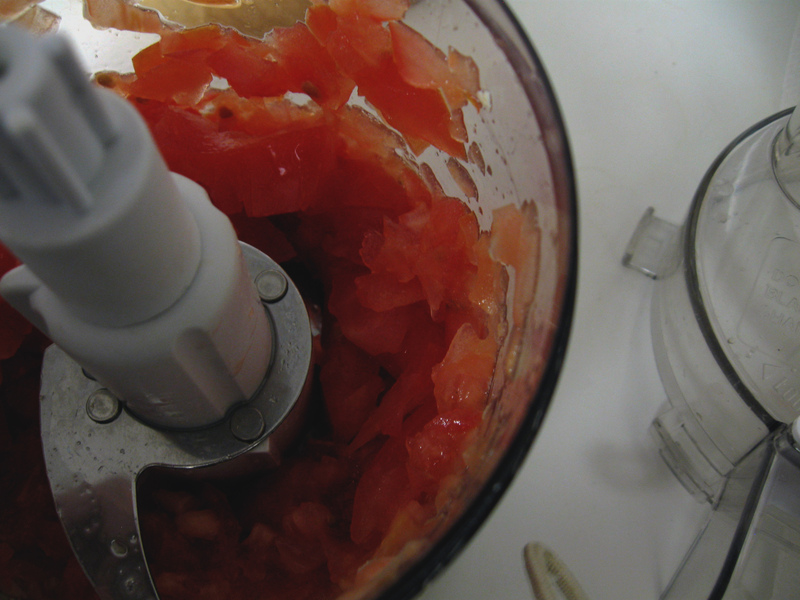 Start by preparing your ingredients, and puree or roughly chop two Roma tomatoes. I love Roma tomatoes. They’re tangy, juicy and de-li-cious! I have a mini food processor for this kind of task. You could just as easily use a blender to help you out, too. Or, if you don’t have either, warm up the tomatoes in the microwave for a few seconds, then use your hands to smush them. Yes, smush is a word. Use it. It works. 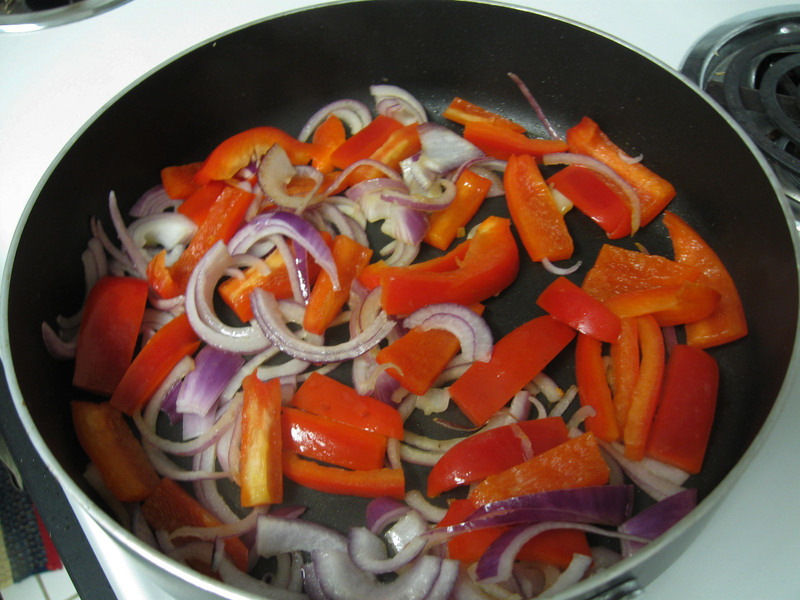 Put 1/2 tablespoon of oil in a shallow skillet or frying pan and wait for it to get screaming hot. 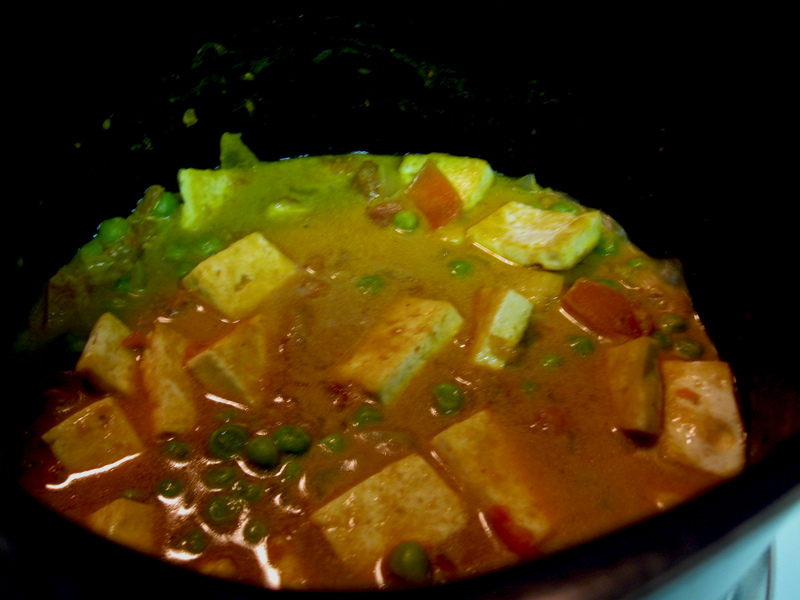 Then, carefully place the tofu pieces (or paneer if you do want to use that) into the pan. It should start sizzling! 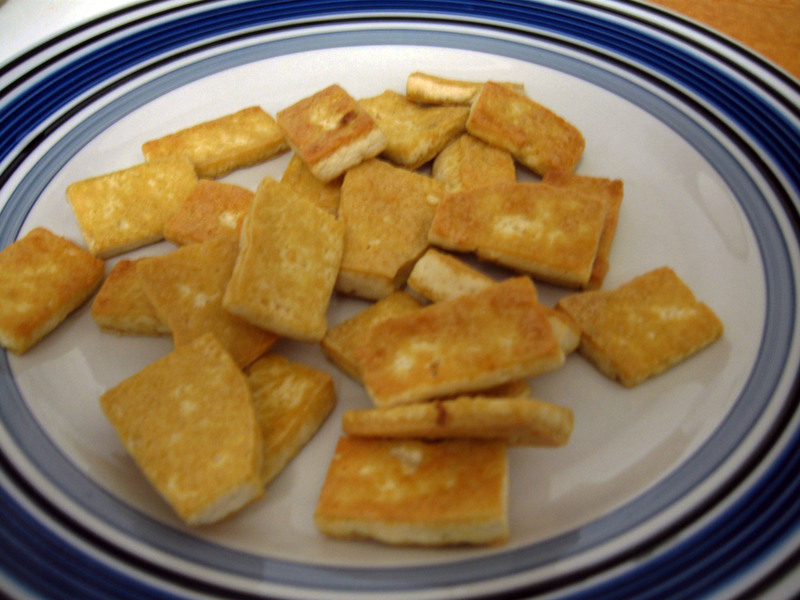 Cook the tofu for about 4 minutes or until golden brown. Like so. I had two batches I had to pan-fry, but they each took about 4 minutes for each side to get brown. 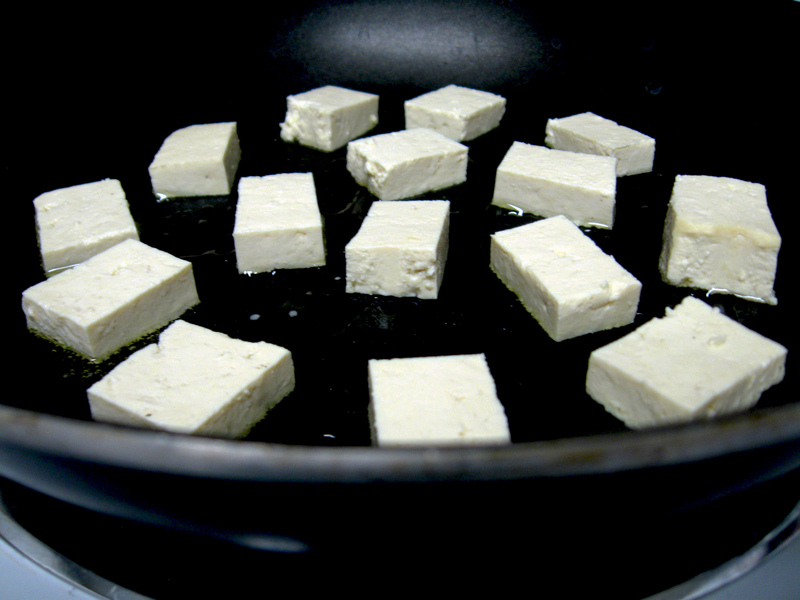 Once of the tofu (or paneer) is cooked, transfer them to a plate with a little sprinkling of water on the bottom. This will help keep the tofu (or paneer) moist while you continue cooking. 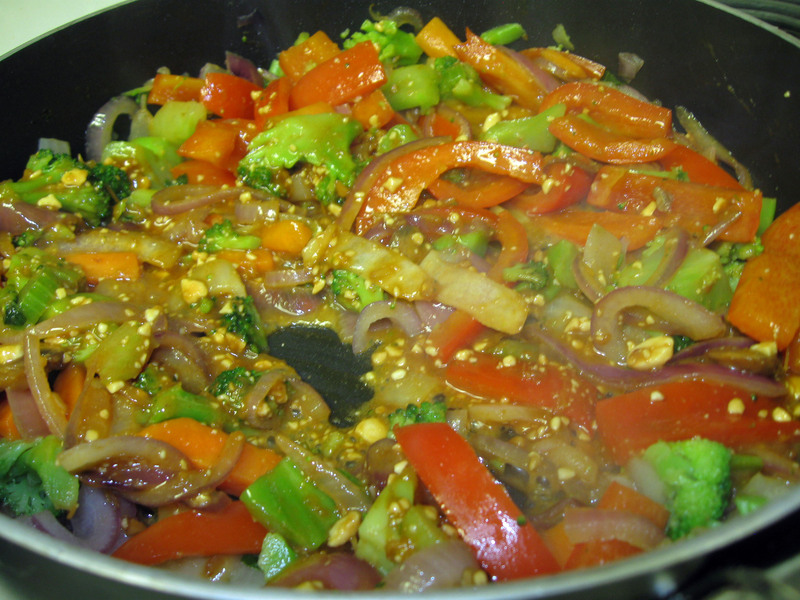 In a saucepan, heat the other 1/2 tablespoon of oil and let it heat up a bit on medium-high. Next, add the garlic (very little!) and the tomatoes. 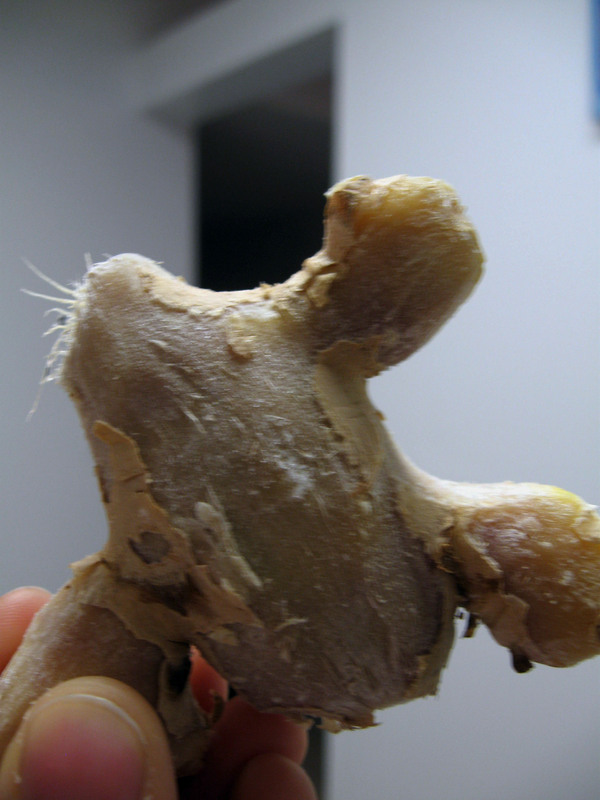 You can also grate the ginger at this time. Give it a good stir and let it cook another 5-7 minutes. 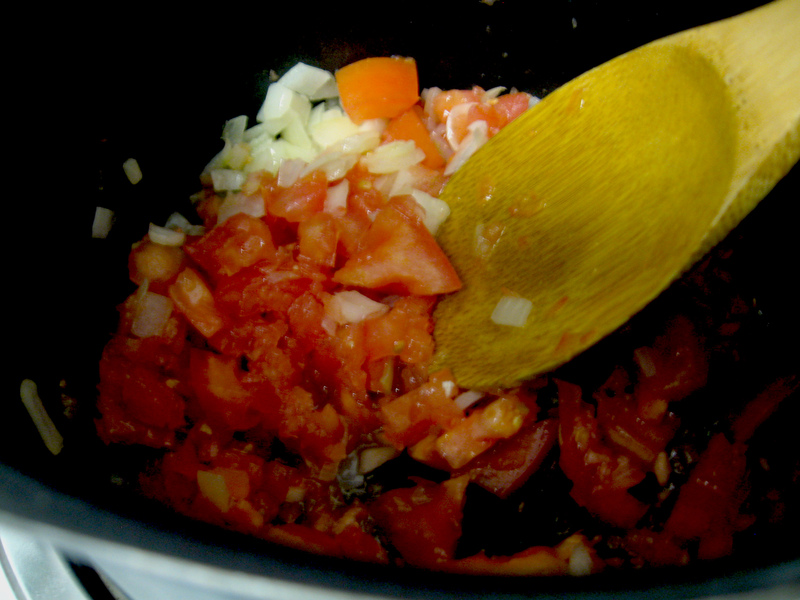 The juice from the tomatoes will help create a gravy, or masala as we call it. Once that’s cooked a bit, stir in the sour cream. 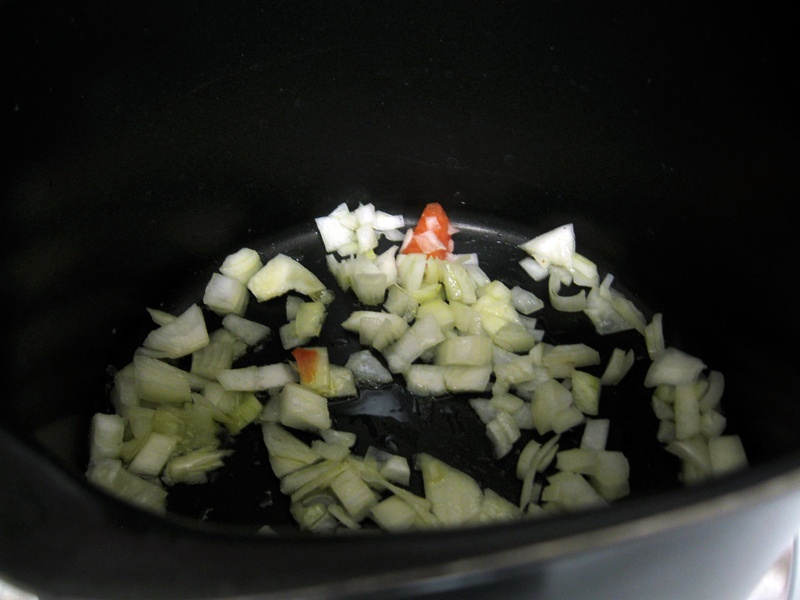 The color will turn a lot lighter and at this point you can add some salt (1/4-to-1/2 teaspoon). Also, add in your garam masala. 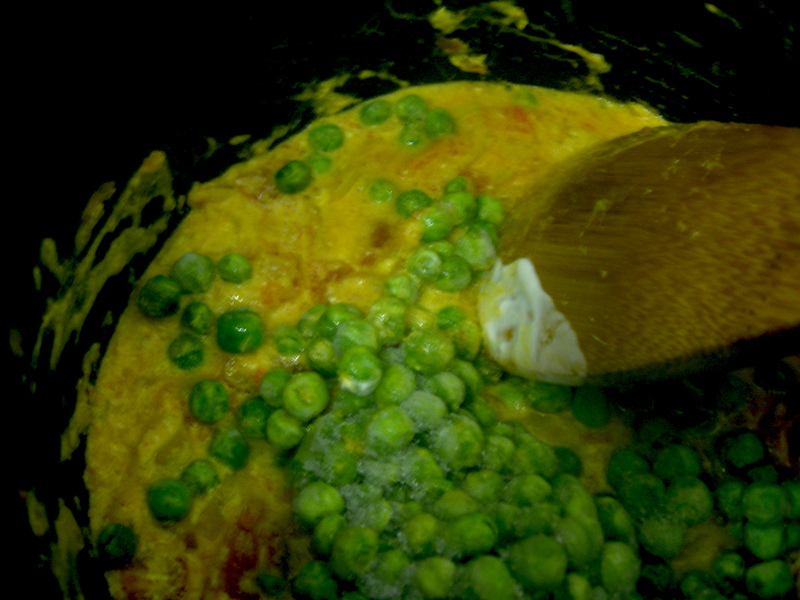 Add in the frozen peas and raise the heat a bit, since the peas (being frozen) will cool the down the dish. Add in the water (not more than 1/2 a cup). Cover and let the curry come to a boil. 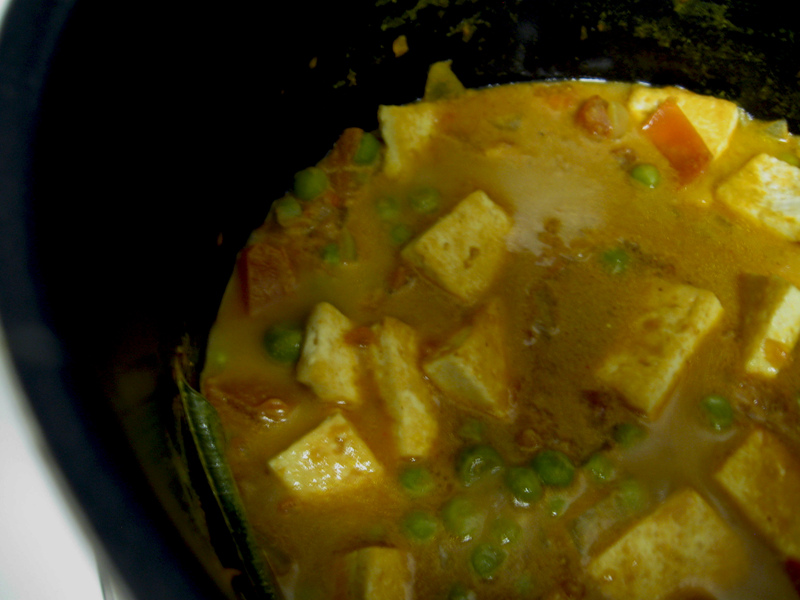 Once it’s come to a boil, remove the lid and add in your tofu (or paneer). 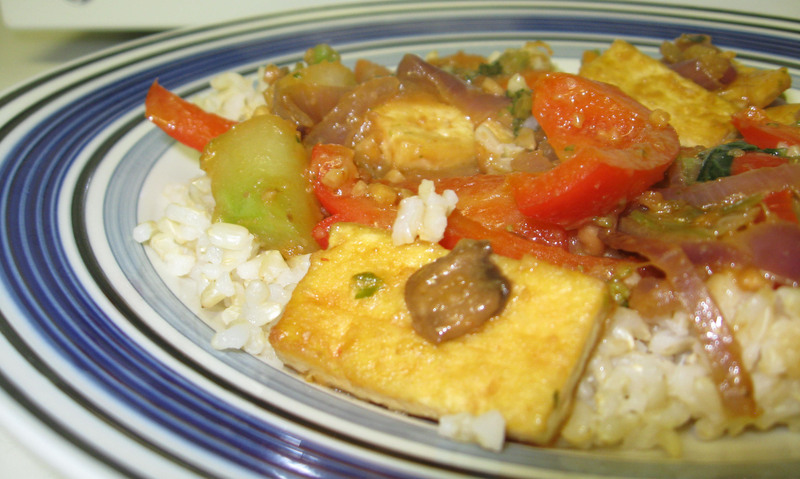 If you are using paneer and not tofu, you must be careful not to break apart the paneer when stirring it into the dish. Since I used firm tofu, it was pretty good at holding its shape. 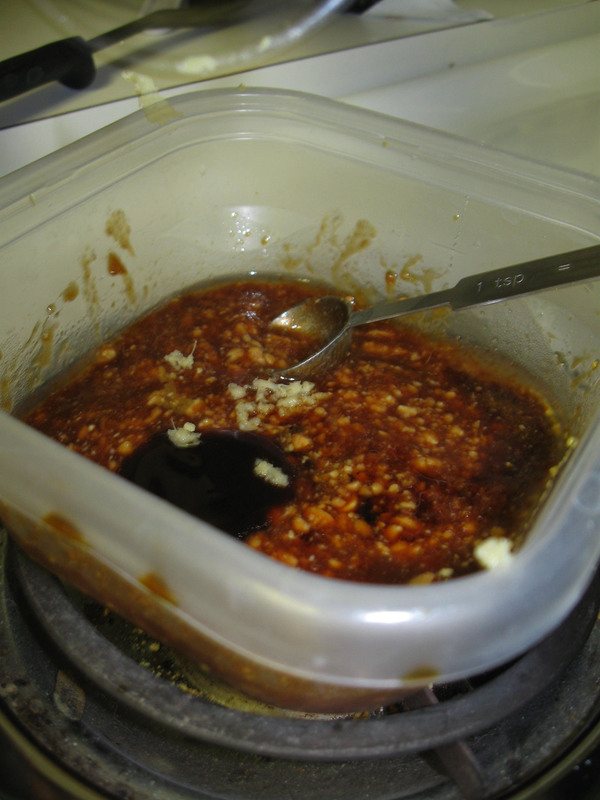 Add in the curry leaves and the tamarind concentrate. 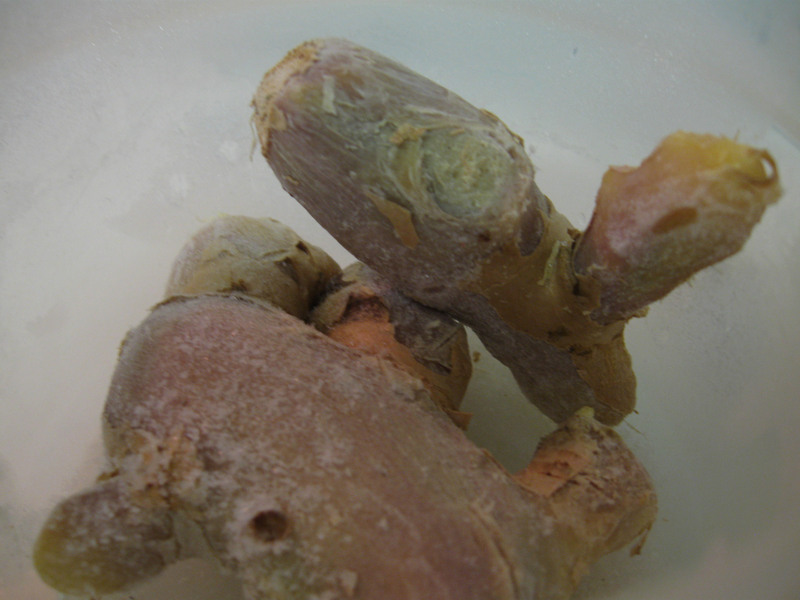 Tamarind concentrate is used in the tamarind chutney when eating samosas. It also adds a tang and burst of flavor when added to any curry dish. You don’t need a lot, since the flavor is so strong. Another bonus is that it helps to thicken the curry. Cover the pan and let it simmer for 5-10 minutes. Give your curry a taste. 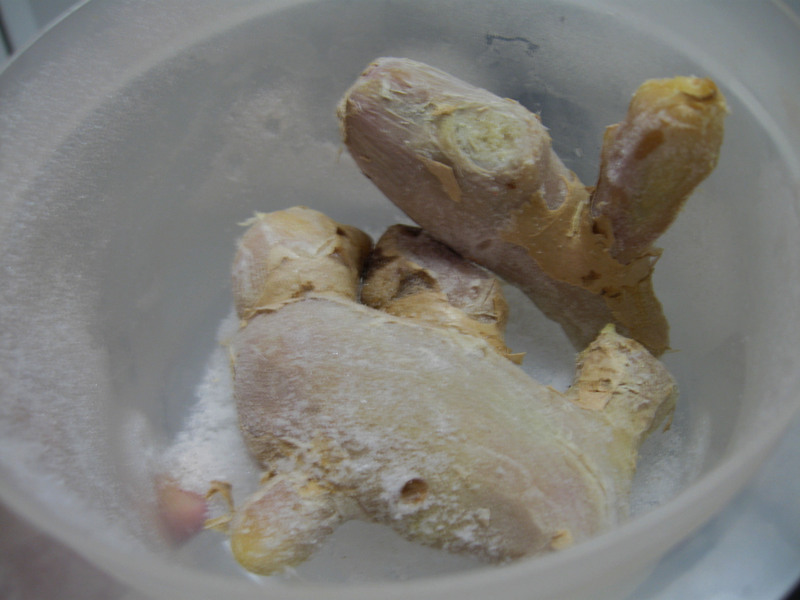 You may need to add more garam masala, ginger or salt depending on how spicy you want your dish to be. Serve it hot over cooked basmati rice. This entry was posted in Food, Indian, Main Dish, Vegetarian and tagged garam masala, Indian cuisine, indian food, mattar paneer, mattar tofu, paneer, spicy, tofu on January 31, 2010 by Aparna B..